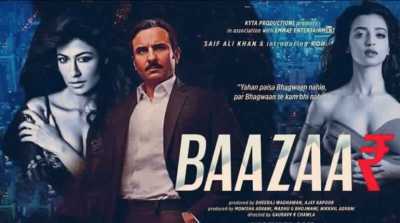 Baazaar (transl. Market; Hindi pronunciation) is a 2018 business crime drama film directed by Gauravv K. Chawla, written by Nikkhil Advani, Aseem Arora and Parveez Sheikh. Starring Saif Ali Khan, debutant Rohan Mehra, Chitrangada Singh and Radhika Apte. The film is set in the backdrop of money, power and business, largely based on the Stock market. The film was released on 26 October 2018. The music of the film is composed by Tanishk Bagchi, Yo Yo Honey Singh, Kanika Kapoor, Sohail Sen and Bilal Saeed while the lyrics are penned by Shabbir Ahmed, Yo Yo Honey Singh, Ikka, Jamil Ahmed, Singhsta, Hommie Dilliwala and Bilal Saeed.